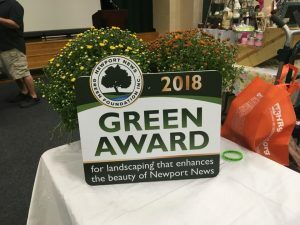 In 2008, the Board of Directors of the Newport News Green Foundation established the Green Awards to recognize businesses throughout the city that maintain landscaping which enhances the beauty of Newport News. Green Award recipients set an example for the community and encourage others to make a visible difference in our city. In 2016, the Board of Directors authorized two additional awards, the Maintenance Award and the People’s Choice Award. The Maintenance Award recognizes past Green Award recipients for continued efforts to maintain their landscape and visually enhance the city. The People’s Choice award is an opportunity for the citizens to pick their favorite property from the four award recipients through a Facebook poll running on the Foundation’s Facebook page (https://www.facebook.com/nngreenfoundation) from September 17th to the 21st. This year’s award is sponsored by Canon Virginia, Inc. and will be presented to the winner at the Foundation’s annual Party at the Pond event on September 26th.